Pocket LED Hand-Held Microscopes, Science Fair Ideas: Educational Innovations, Inc. 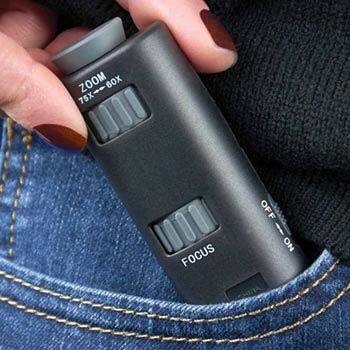 Powerful magnification with an extremely lightweight and portable design. These pocket microscopes features a built-in LED light that provides a bright, clear image and a rubberized eyepiece for comfortable viewing. 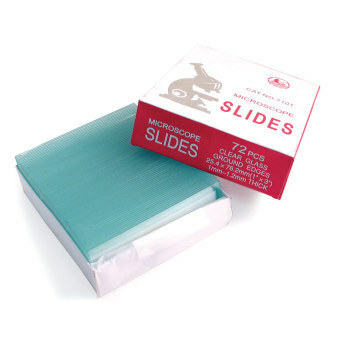 They fit easily in your pocket so you can bring them with you anywhere. 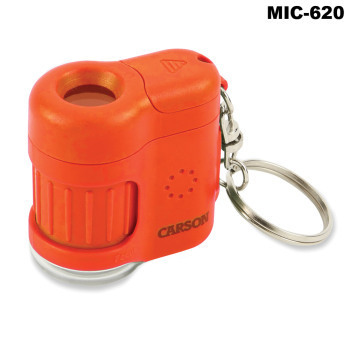 The MIC-620 features a built-in UV light, a key chain ring, and is bright orange to make it easy to find in the field or classroom! 1.3" x 0.5" x 3.5" 2.3" x 1.2" x 3.7" 1.5" x 0.9" x 1.7"
Students can use the microscopes to make observations to construct an evidence-based account that objects can be seen only when illuminated. Students can use the microscopes in an investigation to describe and classify different kinds of materials by their observable properties. Students can use the microscopes to make observations of plants and animals to compare diversity of life in different habitats. Students can use the microscopes in an investigation to develop a simple sketch, drawing, or physical model to illustrate how the shape of an object helps it function as needed to solve a given problem. Students can use the microscopes in an investigation to develop a model to describe that light reflecting from objects and entering the eye allows objects to be seen. Students can use the microscopes to make observations in an investigation to construct an argument that plants and animals have internal and external structures that function to support survival, growth, behavior, and reproduction. Students can use the microscopes to make observations and/or measurements to provide evidence of the effects of weathering or the rate of erosion my water, ice, wind, or vegetation. Students can use the microscopes in an investigation to develop a model to describe that matter is made of particles too small to be seen. Students can use the microscopes with the Glo-Germ Classroom Kit (GLO-210) in an investigation to generate and compare multiple possible solutions to a problem based on how well each is likely to meet the criteria and constraints of the problem. Students can use the microscopes to develop and use a model to describe that waves are reflected, absorbed, or transmitted through various materials. Students can use the microscopes to make observations in an investigation to provide evidence that living things are made of cells, either one cell or many different number and types of cells. Students can use the microscopes to make observations in an investigation to develop and use a model to describe the function of a cell as a whole and ways parts of cells contribute to the function. Students can use the microscopes to make observations to present an argument supported by evidence for how the body is a system of interacting subsystems composed of groups of cells. Students can use the microscopes to make observations, analyze and interpret samples and data on the distribution of fossils and rocks, continental shapes, and seafloor structures to provide evidence of the past plate motions. 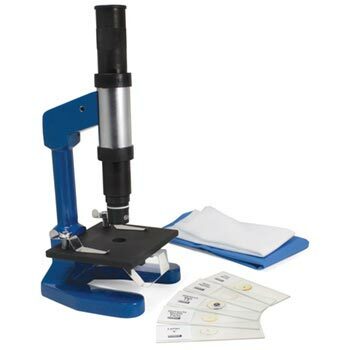 Students can use the microscopes with the Glo-Germ Classroom Kit (GLO-210) to analyze data from sampling student fingerprints to determine similarities and differences. Students can use the microscopes to make observations and develop and use a model to illustrate the hierarchical organization of interacting systems that provide specific functions within multicellular organizations. 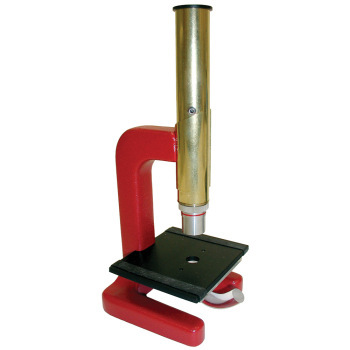 Students can use the microscopes to make observations, construct and revise an explanation based on evidence for the cycling of matter and flow of energy in aerobic and anaerobic conditions. Students can use the microscopes to make observations and develop a model to illustrate how Earth's internal and surface processes operate at different spatial and temporal scales to form continental and ocean-floor features. 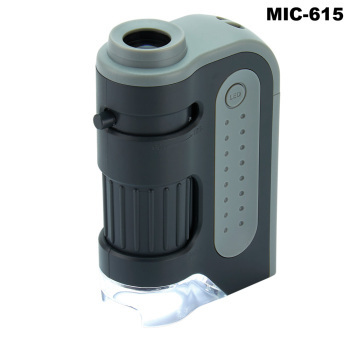 Students can use the microscopes with the Glo-Germ Classroom Kit (GLO-210) in an investigation to evaluate a solution to a complex real-world problem based on prioritized criteria and trade-offs that account for a range of constraints, including cost, safety, reliability, and aesthetics, as well as possible social, cultural, and environmental impacts. Students can use the microscopes to look closely at important organic and inorganic structures that the unaided eye cannot see. Students can better understand samples they find out in the field or prepared slides. Take students out of the classroom and into the field for genuine learning opportunities in Biology, Earth Science, or Environmental Science. Collect water samples and look for invertebrates, compare and contrast leaf and root cells, find pollen and see the spiky structures, or collect sand, dirt or rock samples and identify crystal formations for more accurate identification. Students can use the microscopes for a physical science investigation to understand how light waves move through objects (lenses) and to allow for magnification. 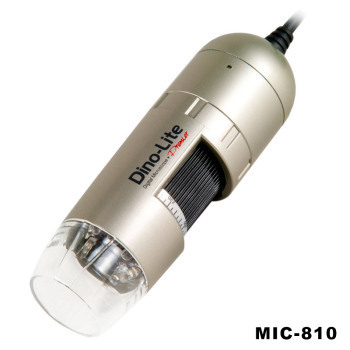 The UV light (MIC-620 only) gives another application of use the microscopes with the Glo-Germ Classroom Kit (GLO-210). It can be used for inquiry activities, such as crime scene scenarios (CSI). Turn on the UV Light to reveal and identify the fine details of fingerprints. By comparing fingerprints at the scene of a crime with the fingerprint record of suspected persons, students can establish the proof of presence and identity of the suspect. No two persons have exactly the same arrangement of the ridge patterns.